In the past week, we are pretty much focussed on Kedaar's birthday plans in evenings. We ordered the blog book in the weekend and we got the book by Tuesday this week. This is amazing, last year it took more than a week for them to even print it. I really liked the blurb.com web site, you can create wonderful memories with their software. The blog book looked great in print. Its more beautiful and all the effort we put for the details (like borders around photos, background color, full size photos, choosing proper layouts etc) really paid off. We think the book turned out to be the highest quality work compared to the previous years birthday books. Next thing is venue. After lot of research, thinking , discussion, we decided that we will celebrate Kedaar's birthday in Seattle Childrens Museum and we made the reservation accordingly. We still have to plan and order the party decors, party favors etc. Kedaar is super excited about his upcoming birthday and thinks about it, talks about it atleast once per day and we are excited too. Years just fly by...., our little one is turning 3 sooon. 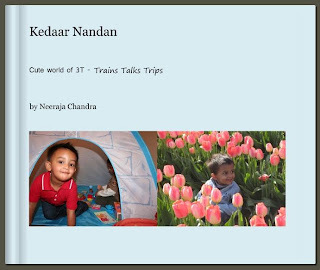 In the past week, I & Chandra worked to make Kedaar's 3rd year blog content + several photos we took in various occassions into a book format. We did this using booksmart software from blurb.com and ordered a copy of the book. We did this for his first year, second year as well for his birthday. I find Kedaar very imaginative when it comes to story making & telling. Even when he is playing by himself, he would hold 2 trains and he makes story around them and talk as if the trains are conversing with each other. Generally in the mornings we need to tell him some stories while he finishes his taking bath, brushing etc. Here is one of such funny stories. [M]Ok, Anaganana there is a crane, crane's nose is long, it wanted to drink water and went to lake. can you drink water with nose Kedaar? Some other funny things to mention. [Mummy]You should open mouth and brush. Otherwise your mouth is like germ's playhouse. [Kedaar starts brushing] Noo, my mouth is not a germ's playhouse.Its a small good crushing mouth. It chews, no black spots. its a nice little mouth. [K] After you leaved, i put only 2,3 (counting with hands) times water. Then I leaved the tub too . now mummy, cover me and give me a hug. [K] . "The tree has no leaves. Not even one. The rain and wind take away all the leaves"
[K]Daddy, i want to listen to the song. [Daddy]ok, and plays "Its a small world song" (that they in "Its a small world" in Disneyland)[Kedaar, with a face lit with happiness] I know this song, I went in a boat when this song came. The boat was going slow like this and I watched so many things. I saw animals, sheep,dance..
Last weekend Chandra and Kedaar went to a grocery store. As this is Halloween season, they put some ghosts, skulls etc in the shop. Looking at the skull, Kedaar started telling various body parts pointing at the skull. He named skull, Eye bone, nose bone, ear bone, neck bone, Ribs, Thigh bone, elbow, knee bone and all other body parts followed by a "bone" word :) We then realized that he learned those at school recently and started applying that. In Kedaar's school, they are carving pumpkins and painting them for Halloween celebrations. Kedaar learned this word "jack o lantern" from that I think. So whenever we go out, his main job now a days is to see around and shout "daddy, there is a jackolantern" if he sees one. I didnt even know this word till today and I ignorantly asked him in car "what is it Kedaar, can you explain". He explained to me "Mummy, that is you carve the pumpkins nicely and then you paint, then it is jackolantern. Remember that ! I want to put a small one at home too" :) I am impressed with his ability to explain to me. Fall colors in Seattle are beautiful. The most beautiful places I enjoy are the place where we live(Issaquah Highlands), on the way to Microsoft grounds(and my office). Here ae some pictures of this years fall colors. This is Kedaar's gift to me for this years mother's day. I was thinking of taking a picture of this and put in his blog for long time and finally did it now. The day care lady (nanny) made this with the foot, hand prints of Kedaar. 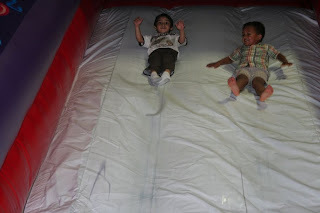 This is a great memory for Kedaar to remember his Nanny's day care friends. After sparklers, Chandra put some other fireworks such as turtles, snakes, flowerpot,eyeballs etc. Kedaar liked them at the same time he got little scared with the sounds. After fireworks, Kedaar had little "Laddu"(Indian sweet, "Vaddu" in Kedaar's words). Overall that was a fun evening. Here are some photos. We took Kedaar to Library recently. We didnt take him to library after he turned 2 and we thought we should cultivate the habit of reading books and also to try get him out of Thomas world little bit. Situation: In car, while going to school. [K]mmmm, O piya piya ("O Priya Opriya" from Gitanjali). Its my ffavorite song? [K]One more time O piya Piya,I like it sooo much. Kedaar was playing today after dinner with Lego blocks. I was checking laptop for something. Suddenly Kedaar asked, "mummy I need your help to put the lego blocks". I told him to try by himself first and then call me if he has questions. Then immediately he raised his hands and looked at me. When I asked him, what he is doing "he said I am raising hand because I need help". Apparently in school, the kids have to raise if kids need any immediate help in doing their activity. I think as the teacher have to deal with around 15-20kids, they have this rule. It was so cute. Kedaar surprises us with some interesting act every day. I was clearling up my mail and I found this draft mail I made long time back just to remember few interesting sentences of Kedaar. Thought I can share them through this post. Daddy(mummy), I was searching for you, then I found you. Mummy, I blocking u. Solve the riddle to go inside house. Are you feeling better now, u have to feel better, OK? Nanny is not happy with me. Mummy, are you happy with me. Lets go ahead and take bath. Daddy, we can switch off water at that time. Here are some pictures of kedaar having fun at Aditya's birthday party, and at Issaquah Salmon festival. 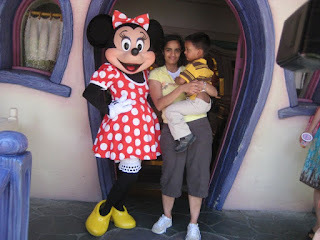 We stayed in LA for 3 nights and visited Disneyland theme park for 2 days. 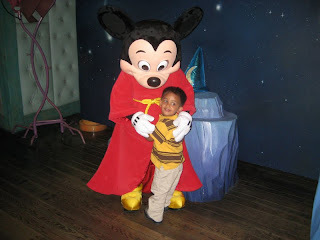 Kedaar had a lot of fun disneyland (we were kind of skeptic because Kedaar is not great fan of disney characters).He did every ride, show allowed for his height. This includes some simple rides like Jimbo the elephant etc in FantasyLand, but also some more difficult ones like Autopia in TomorrowLand. 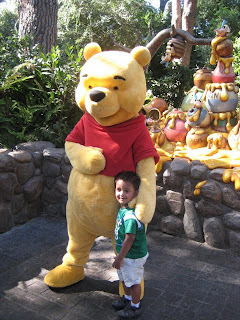 He enjoyed the train ride, pony ride,Jungle cruise,Mickey Minie's house,Fantasmic show,Finding the Nemo,Winnie the Pooh etc. One ride he enjoyed most is the "Its a small world" one, We went there twice.The best part I think for him is the street party which we went on both days. 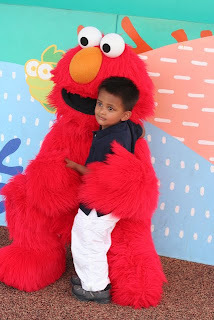 He also met lot of characters, the standard thing he did with each character is give them shakehand,hug them fondly :) One thing Kedaar did for mummy though he is very scared is "boating" . Kedaar didnt want to go initially becuase he has to wear life jacket and have your own paddles, but then he said "mummy will be happy if I go" and then came. We were surprised. He is extremely tired on both days because of heat, lack of proper food etc, but I should really appreciate him for not giving up in hsving fun. 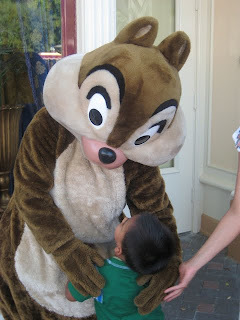 Some rides he got scared , but still did are the ones in which you ride a car or something and in close space there is a story or some type of character (like Alice in Wonderland,Peterpan. I think he got scared because it is dark inside. 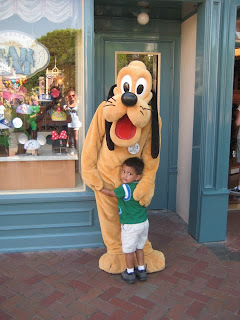 Overall, disneyland was good. On third day, we had lunch and reached Sandiego around 3 PM. We went to beach immediately after checking in and putting luggage in the hotel. We knew that that was our only day for beach as the next 3 days are going to be packed. Beach was awesome, Kedaar was little scared to go little deep into water first, but he did hold mummy, dadddy's hands and did that. He enjoyed a lot. 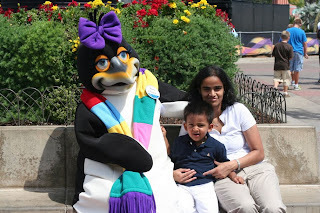 Next day, we went to SeaWorld. SeaWorld is a place that is so fun to visist any time. They also started the Sesame street zone and a couple of rides which I think is fairly new (not there whwn we went 2 yrs back). 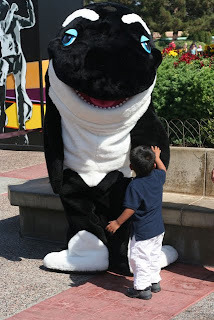 Kedaar had a blast in Seaworld, he loved all the shows (pets one I think is his favorite). He also liked seeing Penguins,big doplhins,colorful aquarium, touching startfish etc. That day we reached home around 8.30 or so. 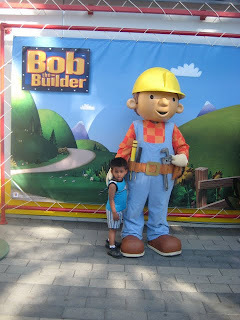 Next day, we went to Legoland. legoland closes by 6 PM, so we went there as early as we could. Legoland was the surprise pack for us and I didnt expect it to be so cool. Kedaar could do so many rides there and almost all of them are his favorites (safari,lego express,sky cruise,getting driver license,playing in water,waterguns ride,horse ride,mini cruise that goes around Miniland,Firefihgting experience etc).Legoland is full of creativity I think and we loved the way they have created a mini USA (Las Vegas strip,Newyork skyline,SFO, WA DC) with Lego blocks. There was a little boat ride which took us around and there were famous structures like Taj Mahal,Eifel tower etc built of millions of Lego blocks). That was awesome. Kedaar was super excited to see "Taj mahal" there and kept shouting the name. Next day , we went to the most famous Sandiego zoo. Zoo was fun and we also saw lots and lots of animals. They have a 1/2 hr bus ride which takes around the zoo and we saw lot of animals clearly in that trip itself. We were so tired and Kedaar in particular that day and I think we could have enjoyed the zoo much better on a different day. Kedaar liked the elephant zone,Pandas a lot. He slept in the evening by the time we went to see turtles, Tapirs etc. We took a video of it so he can see at home.They also had a children's zoo which we got to only at the end of the day and it was closed by then. Next day was our flight back to Seattle around 7 PM. We had lunch in Sandiego,went to Legoland for a 3 hs or so again and then started back to LA. We reached Seattle that night. Few things that really worked well in the trip. 2. 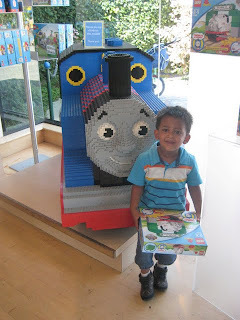 We took 4 surprise thomas friends to Kedaar and gave them one day each (Jeremy the jet,byron the truck, butch the lorry etc). 3. In each place, Kedaar bought one toy or something to remember the place. He made sure he gets it by saying "may be I want to get something here" :). 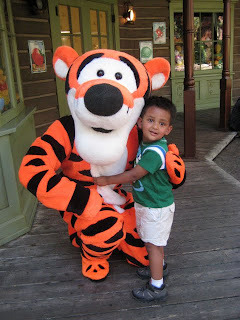 He got Pooh,car in dinsey land, Shamu in Seaworld,Pecy&Tidmuth shed lego blocks in legoland,Pandas in zoo. The new toys also kept him sort of interested through out the trip. 4. Taking stroller was life saver. Kedaar used to get tired a lot and he sat in stroler all the time when he was not doing rides. In Kedaar's class, one child each day will get to be the "Child of the day". I think child of the day gets preference in all the activities they do through out the day. Only children who come exactly on time for the "circle time" at 9 AM will get to be the "Child of the day". His expression, his happiness were so cute & innocent and I keep remembering it. Kedaar is very fond of music, songs, probably like several other kids. He knows lot of songs by lyrics as well.One of his habit is to sing a song with wrong lyrics and then ask us, is this the right song? When mommy or daddy says , "Nooooooo", he feels it as very funny and comes up with more and more wrong words but sings the song with the same tune. "If you happy and you know , then you clap". He sings it as "If you happy and you know, then you TV(road , signal light, sofa,bed,tree,house,doggy etc)". He does this with several other songs like "Om namassivaya","Hrudayam ekkadunnadi",alphabet song (he makes this as something like A, B,C,D,E,F,Jigla.. or some weird word). Kids are so naughty and I think they keep doing funny funny stuff to grab attention all the time. 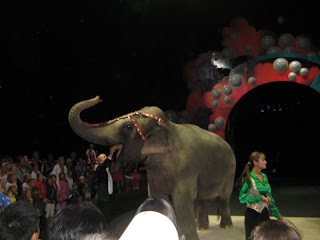 We went to the Ringling Bros&Barnum Bailey in portland few weeks back. I think I have seen this kindof circus probably when I was in school. 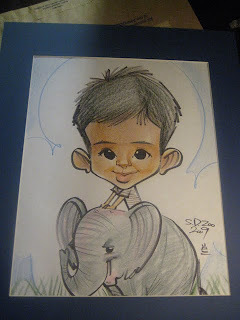 We went to Portland to visit our friends (Kusuma,Madhu & Upasya)and also see the circus.The circus was lot of fun, they also had animals acts by dogs,cats,elephants (painting by elephants was nice),horses,zebras and even tigers. 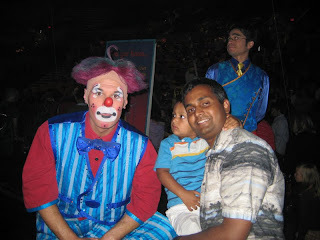 Kedaar liked the circus.We took lot of videos and he likes watching them alot. 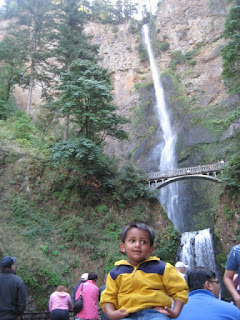 We went to see the Multinoma falls the next day. 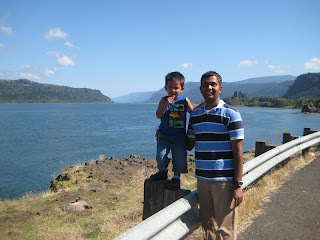 Me& Chandra have been to Portland before, but this is first time for Kedaar. Kedaar also had good time playing with Upasya (who is just 2 weeks older than him). That was a short trip, but was fun.